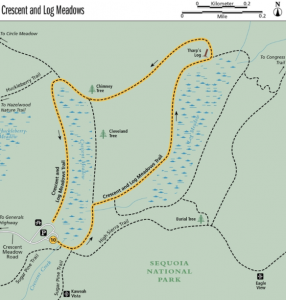 THREE RIVERS, Calif. — Upon my arrival to Sequoia National Park, I was completely awestruck by the giant trees that stood before me, or rather, that I stood before. From the ground up, the giant sequoias are seemingly infinite (Photo by Jamie Servidio). It was a no from the park ranger who led us through the forest, a no from the spokesperson for the parks and a no from nearly every other parks staff member I encountered in gift shops and museums during my visit. I can be a bit relentless. Feeling defeated, I asked Seasonal Ranger Frank Helling, a veteran of 25 years, if anyone had gotten the chance to explore the canopies of the giant trees in the past. Lucky for me, his answer was yes. Ranger Frank told me that it was not so long ago that National Geographic did a story on the President Tree, a giant sequoia measuring 27 feet in diameter, 247 feet tall and about 3,200 years old. The story ran on the cover of the December 2012 issue and featured the photography of Michael “Nick” Nichols. The resulting photograph was a culmination of more than 80 photographs stitched together, fully documenting the giant tree in the midst of a blizzard. A man named Steve Sillett led the climb. In 1996, Sillett became the first scientist to ascend into the redwood canopy, according to Ranger Frank. That same year Sillett began teaching as a professor in the forestry department at Humboldt State University. “You really can’t tell what is happening in the forest from the ground,” Sillett said in a video by National Geographic documenting the experience. Before Sillett, no scientist had ever studied the canopy of giant trees. He has since helped popularize many of the modern tree-climbing techniques researchers use worldwide. To my surprise, this is not entirely true. 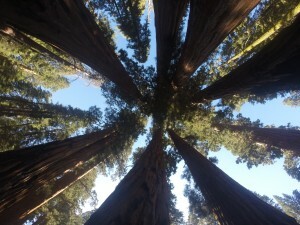 I recently came across a short documentary called “Ground to Crown: Climbing the Giant Sequoia.” The 19-minute video follows several young climbers up to the canopies of old growth giant sequoia trees in Kings Canyon in 2012. Dave Katz, Jake Rudin, Colin Criley and Rob Moore were among the people involved with the climb. While it remains true that unauthorized climbs are illegal and have penalties, the climbers were granted permission to collect cones from three different trees. In collaboration with the University of California at Berkeley, the purpose of the climb was to collect seed cones for the university’s seed bank and other research. UC Berkeley’s seed bank is kept in case of catastrophic loss. In the event of a catastrophe, the collected seeds would be available to provide a stable future for the species. Jake Rudin was an undergrad at Cornell University when he took his first tree climbing class. The class taught different rope and harness techniques. From there, he became an instructor ultimately leading to his research with the giant sequoias. According to Rudin, the scariest part of the climb is the first 150 feet before reaching the first branches because there is nothing underneath you. One of the greatest challenges in tree climbing revolves around choosing which limbs to climb on. Large branches are ideal, but they must be alive and substantial. Dead wood is dangerous because it is fragile and could potentially dislodge debris on to the people below. After mapping out a path up the tree, climbers use tools like a crossbow to launch anchors to the top. It takes an experienced climber approximately 20 minutes to reach the top of a 300-foot tree. From my research, I have concluded that the purpose of data collection paired with advanced climbing experience will grant an individual access to the tops of the Giant Sequoias. “My goal is to understand trees and promote greater awareness of them. Given the precious few truly tall trees remaining, I believe climbing them for recreational purposes is unwarranted and unwise. In my opinion, this is especially true in old-growth forests. This is not to say I discourage you from climbing trees. Far from it! 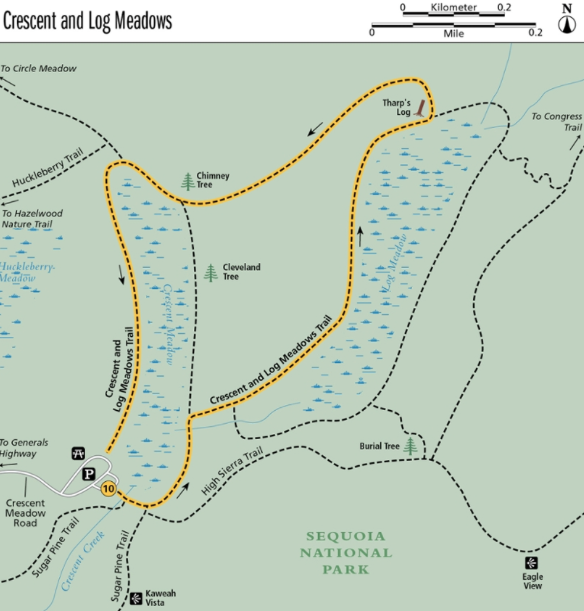 Crescent and Log Meadows (Map courtesy of the National Park Service). You can’t actually climb any of the trees, but visitors can simulate the journey to the top of the Sentinel Tree. On the pavement between the giant sequoia and the Giant Forest Museum, there is a ruler that stretches in length as far as the Sentinel Tree is tall (257 feet).